The VibrationWarehouse.com 120% Low Price Guarantee makes your vibration machine purchase worry-free. We’re so confident that our prices are the best online that we’re willing to put money on it! Find a vibration machine in stock at a lower price on a different website or at a retail store? VibrationWarehouse.com will match any authorized retailer’s current price*, plus an additional 20% of the difference between the lower price and our price. For example: VibrationWarehouse.com has priced a vibration machine at $2000.00, but you found the exact same machine on another website or retail store for $1500.00. VibrationWarehouse.com will refund you $600, bringing your net price to $1400. Did you find a lower price after you’ve already purchased? No problem! 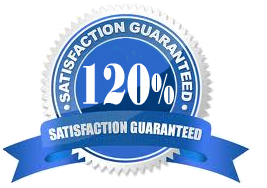 We’ll still offer the 120% Lowest Price Guarantee for up to seven (7) days from the date of purchase. Step 1. Order the vibration machine that you want from VibrationWarehouse.com. Step 2. Contact us and provide your order number, the lower price you found and where you found it (i.e. quote, online link, or an advertisement). Step 3. Our vibration specialists will verify the information and process the price matching request. Please see the section below for a complete list of details. Below are some of the most commonly asked questions on our 120% Lowest Price Guarantee. *We reserve the right to refuse the guarantee if any of the terms are not met or at our discretion. The offer may expire or change without notice. Which competitors will VibrationWarehouse.com price match? VibrationWarehouse.com will price match prices at U.S. or Canada authorized reseller websites and brick and mortar stores. Which vibration machines does VibrationWarehouse.com price match? Almost every WBV machine that we carry. The item must be identical, including model number, color, size, and should include shipping and taxes. The vibration machine must be in stock and available for purchase at that price from an authorized U.S. or Canada reseller, whose authorization we reserve the right to verify. The final price from our competitor should include any additional shipping and taxes. Which vibration machines aren’t available for price match? We don’t price match machines sold on auction sites; used/defective items, taxes and typographical errors; and gift cards or merchandise credits. Are quantities limited on price-matched vibration machines? We may limit the quantities of price-matched machines, particularly if the competitor does. In addition, we reserve the right to limit quantities sold to a customer.